Conservatory & Extension Blog | A Roof for all Reasons! A Roof for all Reasons! Ultraframe has a fantastic reputation both within the industry, and now, thanks to an effective consumer marketing campaign, Ultraframe is developing a profile with the consumer. It’s a reputation earned through 21 years of engineering excellence and a dedication to servicing the conservatory market. We have always prided ourselves on our established engineering capabilities and are proud of the fact that we have a roof to suit every budget, every application, every style and every consumer. But the market is changing and thanks to our own research into buying behaviour and work with the Henley Centre on forecasting, we are ready to deal with that change. Product innovation has always been the cornerstone of Ultraframe’s market leadership. The team tasked with maintaining this status and led by Chris Richardson, Ultraframe’s Group Technical Director, has been strengthened with the key appointment of Andrew Thomson, Design and Development Director. Andrew, a former director at Dyson, was instrumental in their international success. Andrew is bringing a whole new consumer focus to the Ultraframe design and development teams. Ultraframe have three main target audiences: consumers, fabricators and installers. Consumers or homeowners can be divided into “Young Families” and “Empty Nesters”. The “Empty Nesters” are older, slower to decide, making an aspirational purchase and buying into brand reputation and values. 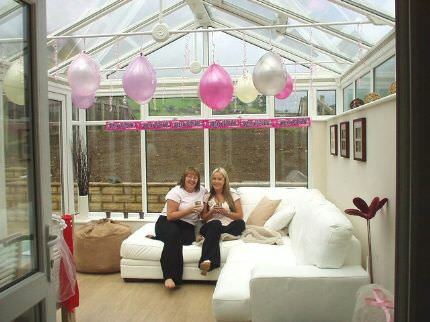 They are more interested in the emotional benefits that conservatories provide like light, wellbeing, and relaxation. For this group the purchase is postponable and competes with other big-ticket items and so we need to tempt them to buy a conservatory over other lifestyle choices. The “Young Families” are the new emerging audience who want the maximum size for the minimum budget They are buying space at the lowest cost and many are using local builders. Both are still important groups but the latter is growing at a far quicker pace and we are developing different products to unlock this potential. All these consumers demand total control of their conservatory environment like shade, temperature, and light but the “Empty Nesters” will be more able to afford it. Both groups want to integrate the design into their own property. This is why our new consumer website has an interactive section that allows the user to design their own ideal conservatory and see how it would look on their property. It also shows many different styles that have already been erected and gives advice on what to look out for and who to go to for advice. Installers are an important audience as they are our link to the consumer. Installers are looking for as much factory pre-assembly as possible. They need to ensure that callbacks are at an absolute minimum as it disrupts labour scheduling and damages their reputation. The Uzone roofing family with its new revolutionary design styling and “click lock” technology is proving to be a massive hit in this market. The innovative fitter friendly roof has just got even better. Ultraframe’s experience with the product has shown that it can now be used for roof size up to 4m x 4m. Most installers will find it suitable for the majority of conservatories they fit. It’s a cost effective made to measure solution that’s incredibly quick to put together. Installation is virtually tool-free due to “click lock” components and the roof has been designed to enhance the internal and external aesthetics of the roof. It provides a more contemporary feel internally while providing a simpler, cleaner roofline externally.